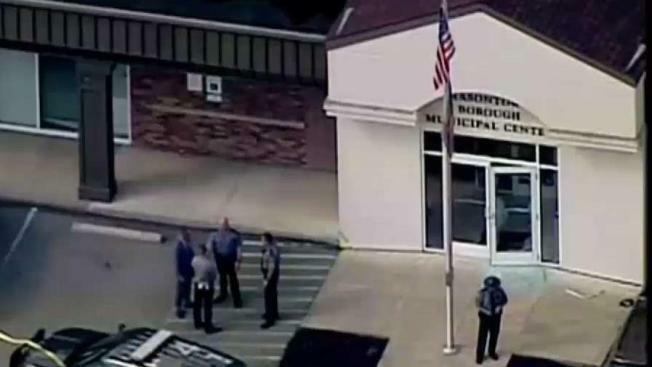 Shootout With Police Ended in Gunman's Death in Pa.
Fayette County District Attorney Richard Bower said Wednesday evening that a German Township police officer shot and killed the gunman after he entered the lobby in Masontown with a handgun drawn and opened fire injuring four people. Bower declined to name the gunman, saying only that he was due in court on charges related to a recent domestic violence incident. Bower said Masontown police Sgt. R. Scott Miller first encountered the gunman and was injured when he exchanged gunfire with the shooter. When Miller took cover, Bower said the gunman proceeded to fire shots injuring two men and one woman.